Doll snowboard and accessories set by Molly Dolly. Perfectly sized for all 18" dolls such as Our Generation dolls or other similar sized dolls. 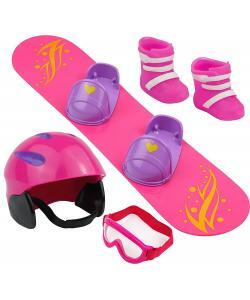 This deluxe set includes snowboard, helmet, goggles and a pair of ski boots. Each piece is very high quality. 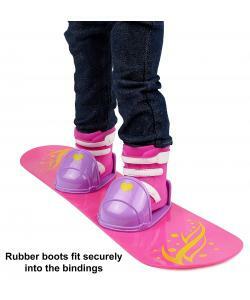 The rubber boots fit securely into the bindings on the snowboard. Snowboard measures 15 inches long. 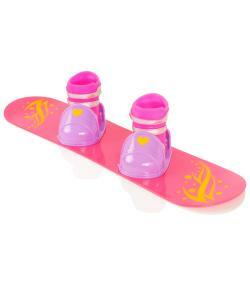 Your 18 inch doll can hit the slopes with this Snowboard Set! 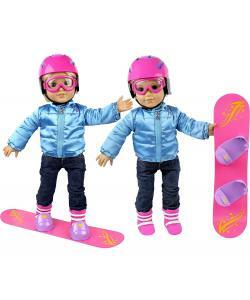 Gear up with the pink safety helmet and matching goggles to shield your doll's eyes from the cold mountain breeze. 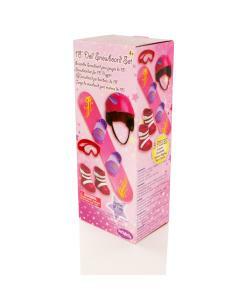 The purple doll snowboard boots will make sure your doll's feet are tightly secured inside the openings on the pink snowboard. With this set, your 18" doll will have all the gear she needs to race down those snow covered mountains!